Remarkable first issue of "Notre-Dame de Paris" in an exceptional contemporary signed cathedral binding. “This first edition, in good condition, is the rarest of all the author's works; it had a worldwide impact, and it's one of the most difficult to get from the Romantic period” (Carteret). Two 8vo volumes [209 x 126 mm] of: I/ (4) ll. for the half-title, title and foreword, 404 pp. ; II/ (2) ll., 536 pp. Both titles are illustrated with Tony Johannot's woodcuts. 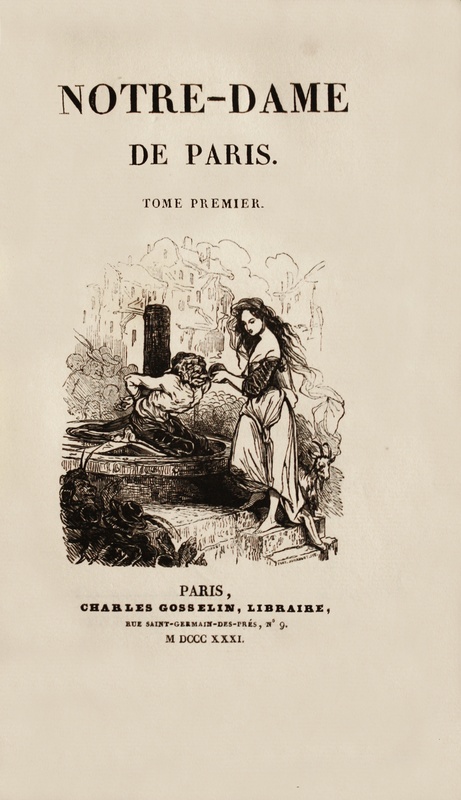 Edition: first issue, without mention of edition or author name on the title-page. Flat spines in light-brown calf decorated “with a beautiful cathedral pattern” and corners in light-brown calf, covers in marbled paper, marbled edges, upper joint of volume 2 slightly cracking at foot. Contemporary binding signed by Ledoux. 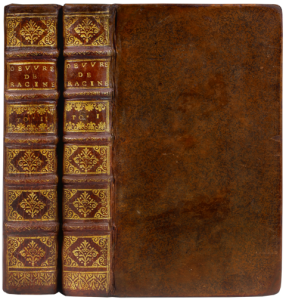 Rare first edition of the first issue – without fictive mention of edition – of “ Notre-Dame de Paris” in a beautiful contemporary binding. 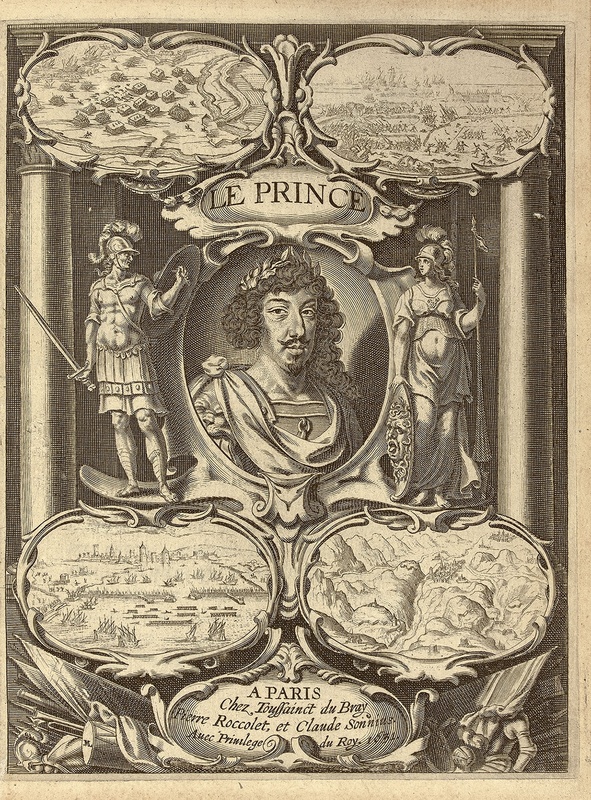 Escoffier 870; Vicaire, Manuel de l’amateur de livres du XIXe siècle, IV, 256-257. “This first edition, in good condition, is the rarest of all the author's works; it had a worldwide impact, and it's one of the most difficult to get from the Romantic period” (Carteret, I, pp. 400-402). “Since Gosselin's copy appeared at auction (Leroy auction, March, 26-27th, 1931, N°328), it became indisputable that the mention of a second or third edition doesn't take anything from the first edition nature of a book. 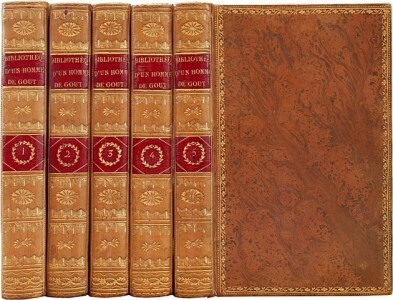 ‘First edition published in 1100 copies that have been, following the habits of the book trade at the time, divided into four editions. [Signed]. Charles Gosselin, editor’ ”. (Escoffier, Le Mouvement romantique, 870). Remarkable copy, with wide margins (height: 209 mm), preserved in its elegant signed contemporary binding with a cathedral pattern. 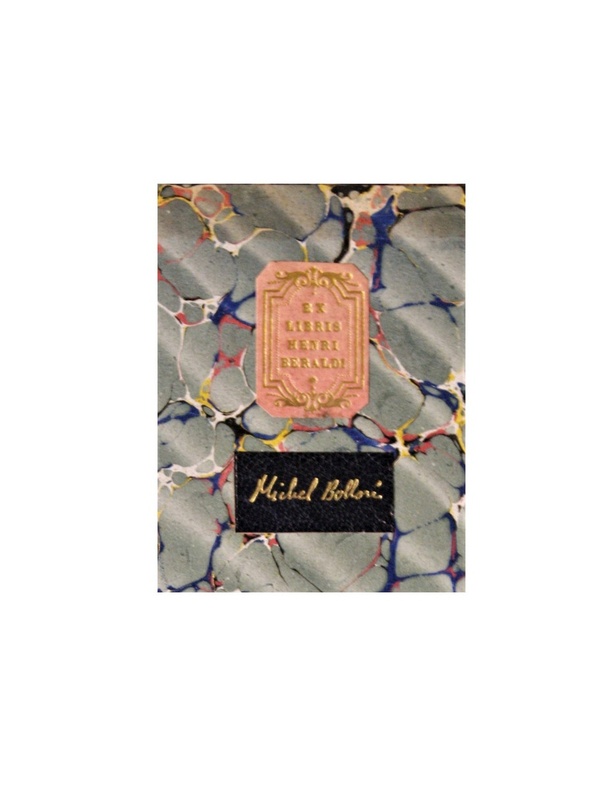 He comes from the library of H. Béraldi with ex-libris thus described: “Very rare and precious copy with its contemporary binding signed Ledoux. The spines are decorated with a cathedral pattern”. (Ref. 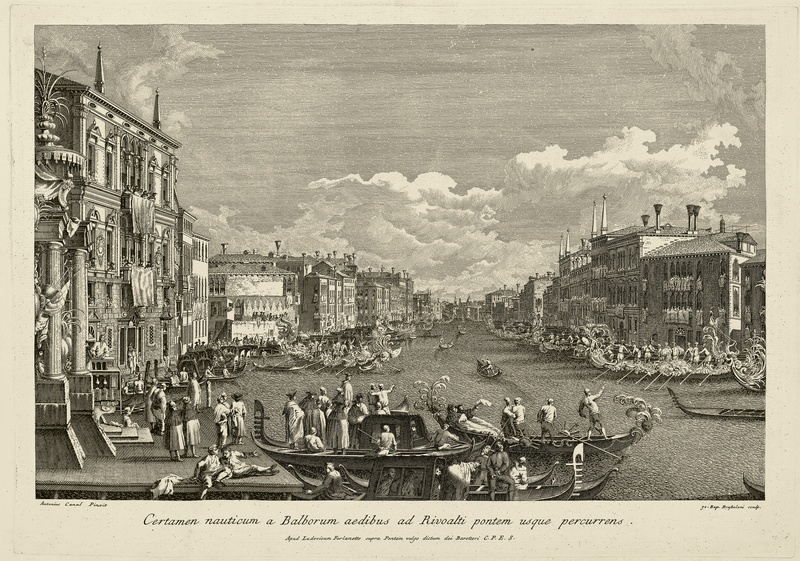 : H. Béraldi, III, n°214). rare books first edition precious books HUGO, Victor. Notre-Dame de Paris. 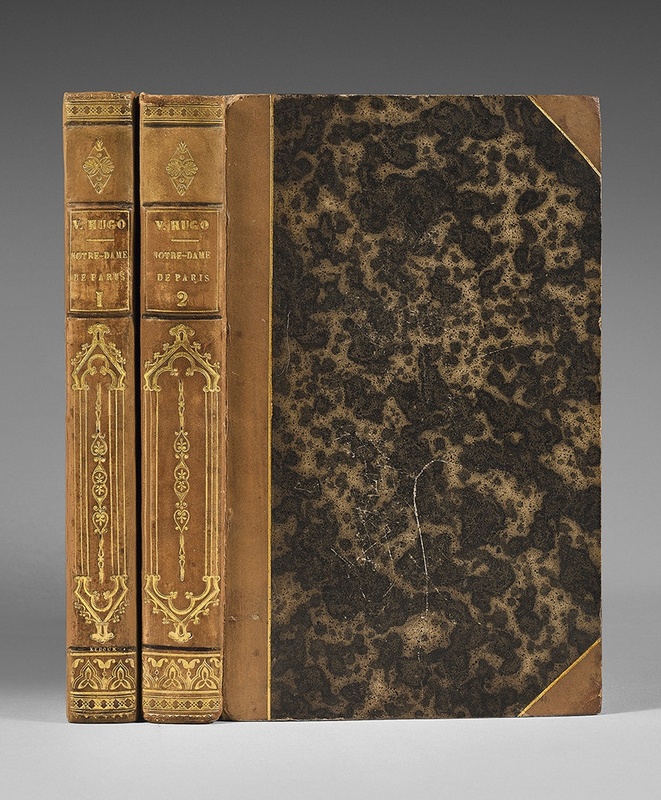 Rare first edition of the first issue – without fictive mention of edition – of “ Notre-Dame de Paris” in a beautiful contemporary binding.Escoffier 870; Vicaire, Manuel de l’amateur de livres du XIXe siècle, IV, 256-257. “Since Gosselin's copy appeared at auction (Leroy auction, March, 26-27th, 1931, N°328), it became indisputable that the mention of a second or third edition doesn't take anything from the first edition nature of a book.Gosselin-Leroy's copy bore indeed on a fourth edition of Notre-Dame de Paris, 1831, the following autograph note:‘First edition published in 1100 copies that have been, following the habits of the book trade at the time, divided into four editions. [Signed]. Charles Gosselin, editor’ ”. (Escoffier, Le Mouvement romantique, 870). 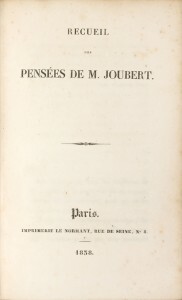 Recueil des pensées de M. Joubert. 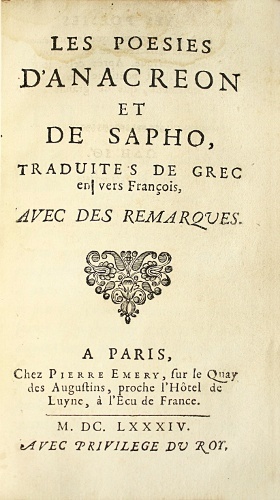 Les Poésies d’Anacréon et de Sapho, traduites de grec en vers François, avec des remarques. BARBIER, Antoine-Alexandre / DESSESSARTS, N.L.M.